One of the most beautiful pieces of jewelry created for The Lord of the Rings film trilogy is the elegant pendant known as Arwen's necklace. Worn by the Elven Princess Arwen, this striking necklace is also known as the Evenstar necklace, the name given to Arwen by her people because of her incredible beauty. Well-known jewelry designer Jasmine Watson's spectacular and stunning designs are seen in J. R. R. Tolkien's Lord of the Rings films. In an interview with War of the Ring, Ms. Watson tells how the Arwen Evenstar necklace required the most time to design. She felt that it was essential that the importance and complexity of the necklace throughout the films be reflected in its intricate and delicate design. The necklace, symbolizing the very essence of Arwen's being and unparalleled loveliness, also had to relay a sense of the magical and clever powers of the Princess of the Elves that created it for her. 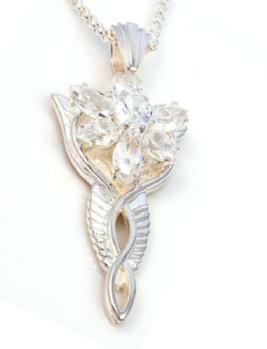 Princess Arwen Evenstar gave her beautiful necklace to Aragon to pledge her eternal love to him. This special gift from an immortal elf to a mortal man symbolized Arwen's decision to forsake her immortality to be with the person she truly loves. The meaning behind the Arwen Evenstar pendant has made it quickly become a popular jewelry item to give as a symbol of love to one's partner. The exquisite celestial design of seven sparkling crystals arranged like a flower set in finely engraved sterling silver, combined with the flowing and intertwining art nouveau stylized lines make this gorgeous pendant appear to be truly magical. Manufactured in New Zealand, home of the Middle Earth, this incredibly beautiful necklace is available from Pandora Jewelry Box. This website is among those in New Zealand that are licensed to sell official Lord of The Rings jewelry from New Line Productions. There are many replicas and variations of this beautiful necklace ranging from elegant European crystals set in sterling silver to a silver plated child's necklace. This Evanstar variation from LOTR Jewlery has a topaz in the middle of it. Tolkien Shop sells many variations including a European version, American version and a version with filigree. Whether you are a Lord of The Rings fan or just love the delicate intricacy of this stunning piece, the star-like magical quality of Arwen's Necklace makes this a fashion accessory that is certain to become a favorite to be worn time and time again.